Find delicious latkes around Los Angeles. 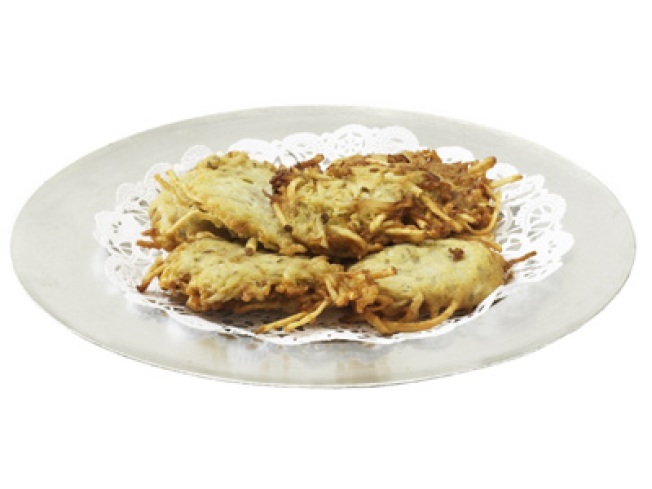 Latkes: They're a year-round treat that receive much goodly attention come Hanukkah. The potato pancakes, crispy on the outside and meaty-tender (and hot) within, cool down courtesy of applesauce or sour cream. Or both. Yes to both. Who's serving:Canter's latke is notably generous; a real plate-filler. Nate 'n Al has a devoted following for their pancakery. Brent's Deli in Northridge does a cherry applesauce for its latke. And Akasha is serving the treat alongside shots of an organic artisan vodka through December 18th. The Akasha latke: A horseradish creme, gravlox, and wasabi tobiko are three of the topping choices, along with the traditional sour-creamy-applesauce goodness. Making latkes at home: So possible, so welcome. You can find Linda's Gourmet Latkes, which were recently featured in Real Simple, at various Gelson's and Whole Foods around Los Angeles, as well as a number of specialty shops. (We should also mention that chef Linda is a local.) And the Trader Joe's latkes continue to be a freezer-shelf staple. The all-latke shop: Could this happen, right here in our town? With 15 types of applesauce? We can dream. Chefs of Los Angeles, we're just saying.